You’re hungry, you’re feeling lazy, and fast food of any kind sounds disgusting but you don’t want to go the same sit down places you always go to. It happens to us all. So what do you do? Sure, you could check Yelp and rely on the opinions of strangers; but I ask you, dear reader, who knows more about food than a fat guy? In this ongoing series I’m going to review local Saint Louis restaurants that my wife and I have discovered where you can be sure to find tasty food well worth your time and hard earned cash. Type of Food: Bar and Grill that specializes in pork BBQ. Price: Middle of the road, but you get a ton of food for the money. Fat People Friendly? : The booths are attached to the wall and will be a no-go for the extremely thick. Chairs at the tables are padded but get uncomfortable after a while. Kid Friendly? : They do have a decent selection of food for the kiddos, and a few arcade games at the front of the store. Also, at Christmas time someone dresses as Santa Claus and comes through the restaurant periodically during the dinner rush to hand out candy. It was really sweet. Review: My wife and I decided to give this little gem a try on a whim one evening when we were out with our son and didn’t feel like cooking. Boy are we glad we did. 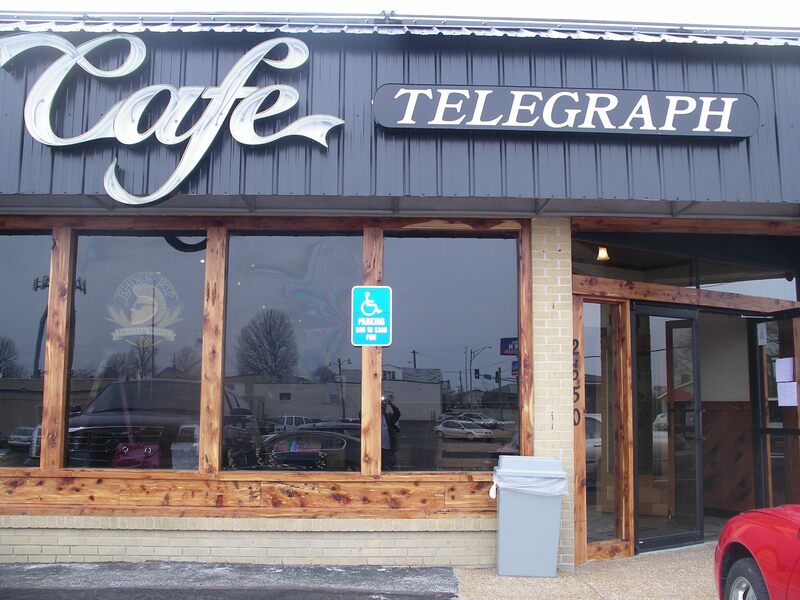 Cafe Telegraph has become one of our regular spots, and once you give their food a try it’ll become an out to eat staple you’ll want to tell your friends about. The menu offers a variety of typical Bar and Grill staples, like burgers and even Saint Louis style pizza, but the specialty here is the pork. They offer a variety of unique pork burgers that are both tasty and freaking huge. For example, the one pound Mary Mother Triple Bacon Burger made with ground pork and bacon, topped with two panko encrusted bacon strips, more crumbled bacon, onion straws, jalapenos, and gringo cheese dip (freaking delicious!) all on Texas toast. It comes with a side of your choice and costs $11.99. This was the first thing I ever tried and I could only finish half. Over the course of the last year my wife and I have tried quite a few of their various dishes, including their wraps, pasta, and various entree options like meat loaf and steak. Everything we’ve tried we’ve enjoyed. Especially the fried okra. It’s the best fried okra I’ve ever had. Ever! The Thick Man Reccomends: While you can’t go wrong with just about anything on the menu, the reason we go there once a week and have become Cafe Telegraph evangelicals to our friends and family is the Matt’s Big Bruiser Pork Steak. This monster is a 3 lb(!) 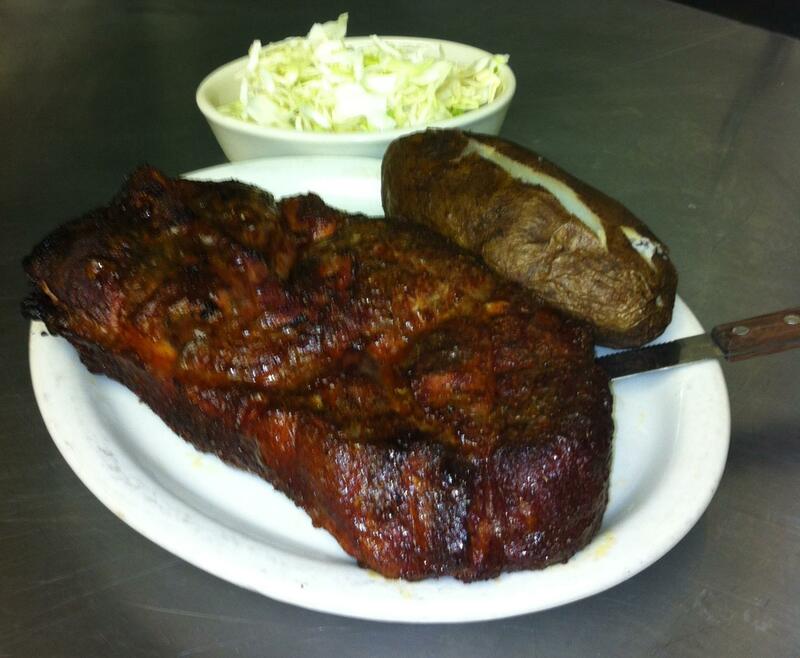 pork steak with a sweet dry rub and two sides for $16.99. It’s slow cooked to perfection and practically falls off the bone. It is also the best BBQ I’ve ever had in my life. I say this as a man who grew up in Memphis, TN around Memphis BBQ. Best. Pork. Ever. My wife and I split one of these bad boys whenever we go in and we both leave feeling stuffed. Two grown adults, one of them thick, stuffed to the gills with delicious food for $17? That right there is a deal. We’ve dragged all of our friends and family out to Cafe Telegraph to give it a try, and they’ve all walked away with the same reaction. They’ve also all become regular customers. If you live in the STL area, or if you happen to come through, do yourself a favor and pay Cafe Telegraph a visit and give this a try. Tell them the Thick Man sent you.